There's not much original habitat left around here-- all ag fields, channelized rivers, and a whole lot of non-native vegetation. 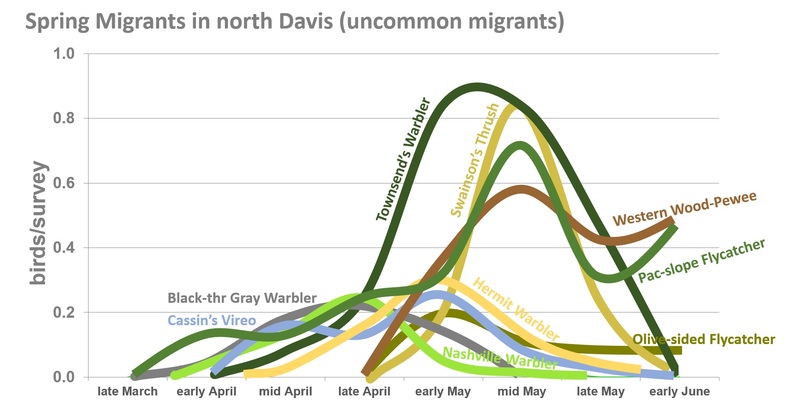 Four of the historically prominent riparian breeders (Yellow-billed Cuckoo, Willow Flycatcher, Bell's Vireo, Yellow Warbler) are extirpated or only pass through as migrants. But there are --and deservedly so-- quite a few habitat restoration projects, some very large, that provide great birding opportunities. Local specialties? Lots of Swainson's Hawks in summer, plenty of Yellow-billed Magpies, Tricolored Blackbirds and Ross' Geese if you do some searching, good spots for Common Poorwill, Bell's Sparrow, and Lesser Nighthawks, some of the best shorebirding in North America when water levels are right, and impressive songbird migration (especially May and September). 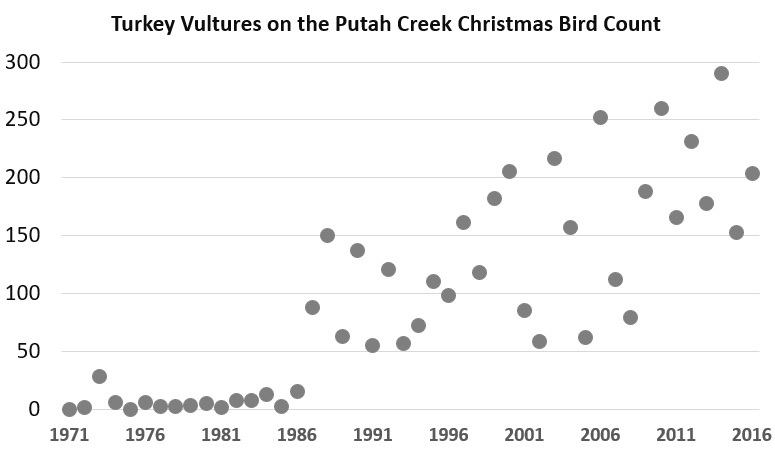 It has every species' status thru the year in bar graphs-- and is guaranteed more accurate than eBird! For all records after Jan 1, 2019, this list only includes Code 5 species from the 2019 edition of the Yolo County Checklist. 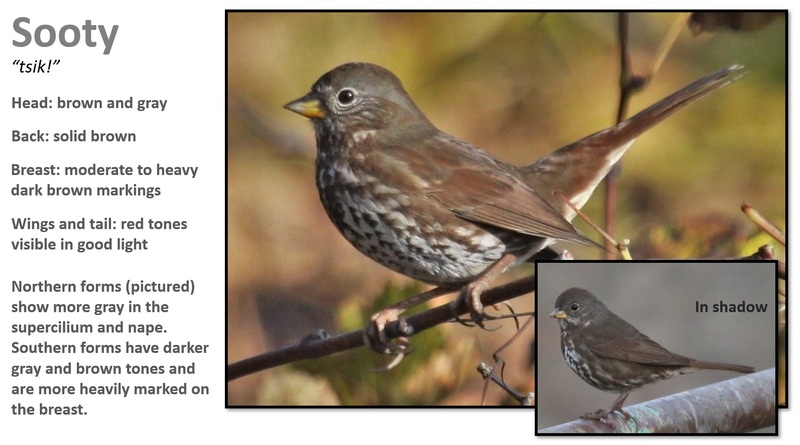 For records from spring 2004 thru 2018, it includes Code 5 species (i.e. species with individual records, not dotted lines) from the 2004 edition. For records before spring 2004, it uses the 1993 edition. Additional note: Iceland Gull now includes thayeri, kumlieni, and glaucoides. All three have occurred in the county. For posterity, the white-winged individuals resembling nominate glaucoides are included here. In addition to these sites, the Yolo Audubon website has a recently revised extensive list of birding locations (with eBird links). These are two separate facilities, with separate access rules, but they are immediately adjacent, some of the birds move back and forth, and they share an eBird hotspot. Go east from the intersection of Rd 102 and Gibson. As you reach the ponds, the Woodland/Davis Clean Water Facility is on your left; it features a large stormwater retention basin, called North Regional Pond. You may drive onto the gravel road next to the pond and park at the north end or anywhere along it. Access is 24/7. To the south (on your right as you drive in), is the Woodland Wastewater Treatment Facility. Park by the chain link fence where a small brown sign says "Birder Parking". Do not go to the office; do not drive around the ponds. You may walk around the ponds, but must stay 100 yards away from the office area. Access is only M-F 7:30 AM to 3:30 PM. Closed weekends and holidays. Located on Rd 28H east of Rd 105, birders are no longer allowed to enter the facility. However, you can bird from the road. A scope is helpful. If the red gate is closed, you can park on the driveway near it. If it's open, you can drive down and park near the office in the parking area outside the fence. Continue east down the driveway past the Davis Wastewater Treatment Plant. There is a small kiosk at the yellow gate to sign in as you leave the pavement. Proceed east along the gravel levee top, then angle down and continue east. Open daily 7am-1pm Feb 16-Aug 31; Mondays only Sept 1-Feb 15. 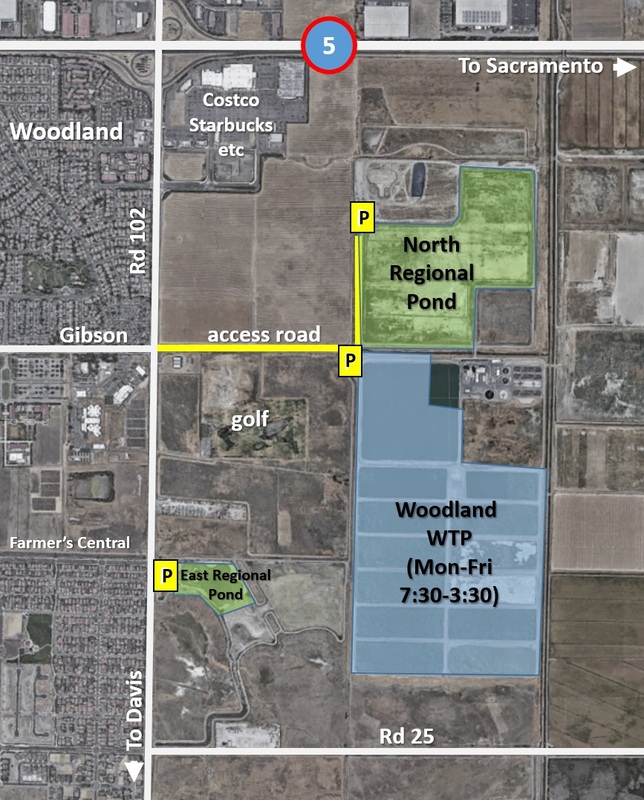 Just west of the Davis Wastewater Treatment Plant, access is restricted and the rules change often. Birding can be done from the gravel road on the levee above Rd 28H; a scope is needed. There are fewer gulls present on weekends, as there are fewer garbage deliveries. Access is from the frontage road on the south side of I-80, on the west side of the Yolo Causeway. Drive up and over the levee. The auto tour loops are well-marked. The old (main) loop take off south from Lot A. The new loop takes off east from Lot A and joins the old loop. Access beyond the hunter check station is restricted during hunting season. There is no public access south of Lot G.
Located at the corner of Mace (Rd 104) and Tremont southeast of Davis. The best birding is among the trees of the archery links (arranged like a golf course). To avoid archers, it's best to go only on weekdays before 9am. Always walk downrange toward the targets; do not suddenly appear behind a target. Access from the River Road north of West Sacramento. Go west on Rd 126 and park where the road drops off the levee; do not block the gate on the levee. 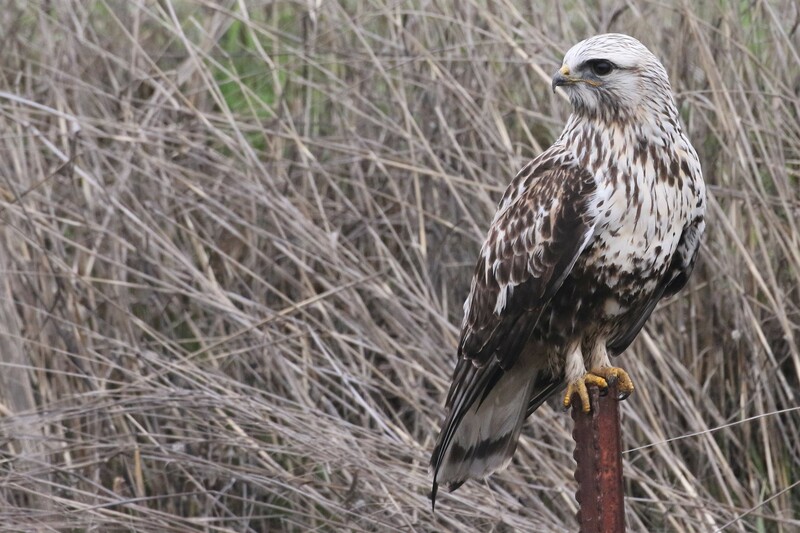 The main birding area is the riparian strip that runs west from the parking area to the Yolo Bypass. You can walk on the levee or below it next to the trees. This popular riparian strip is along Babel Slough Rd from River Rd running southwest. The shoulders on Babel Slough Rd are private, thus there is no parking; park along the River Rd. The best birding is often in the first 1/4 mile closest to River Rd. The primary birding area is a path along the river between Pedrick Rd and Hopkins Rd. There is parking at each end: just east of Pedrick as well as along Levee Rd near the picnic area. The "bird bath" is a clearing approximately midway between Pedrick and Hopkins where birds often congregate to bathe in the creek. Note the Yolo/Solano County line leaves the river and follows the old river bed just west and north of Brooks Rd, running thru the middle of the sheep pens. The famous spot is the large curve of Hwy 128 west of Winters. There is a large pull off on the northwest (westbound) side of the road. In recent years, the birds have been east-northeast of the parking area, often on the low barbed wire fence that runs north, perpendicular away from the road. There are five fishing accesses, operated by California Dept of Fish & Wildlife and Yolo County, along Hwy 128 in Putah Creek Canyon between Pleasant Valley Rd and Lake Berryessa. Most have parking lots and bathrooms. All have trails along the river. Parking along the highway is also possible at pullouts. They are numbered #1 thru #5, with #1 being furthest upstream. #2 is unmarked and closed with a gate, but can be easily accessed on foot from #1. Gray's Bend refers to the various county roads west of the Fremont Weir Wildlife Area. These can be birded by car, bike, or foot. The Fremont Weir Wildlife Area can be entered from the west (from Rd 102 or Knight's Landing) or east (from Rd 117). The parking lot at the west entrance is currently closed, as a landowner has asserted it's his land. You can park on the road (although there are no pullouts nearby) and walk or bike in. He may challenge you but will probably let you pass. From the east, you can park at the west end of Rd 16 accessed from Rd 117, and walk or bike north up the levee to the weir, where you can access the wildlife area proper, as well as the riparian woods in that area. 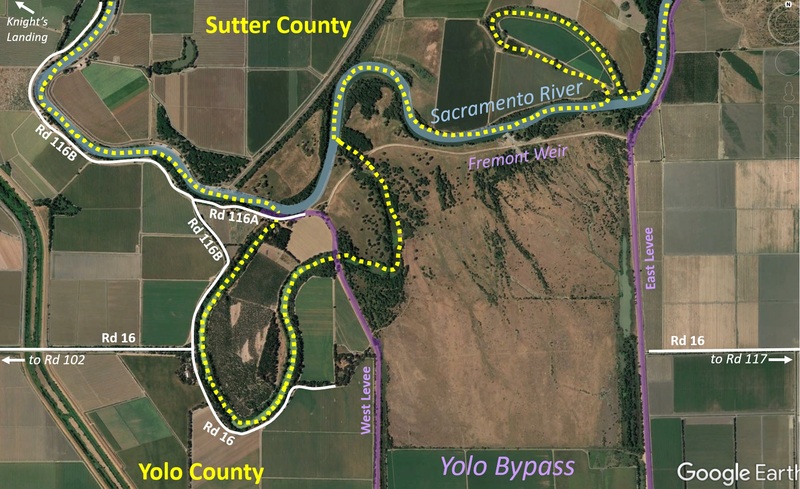 Note the Yolo/Sutter County line follows the historic Sacramento River channel, which are now oxbow lakes. 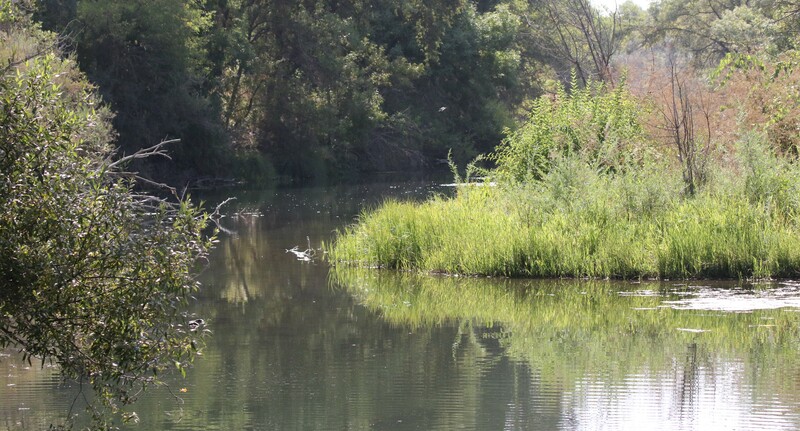 Thus, the eastern entrance to the Fremont Weir Wildlife Area is in Sutter County. Wild Wings Park offers access to Cache Creek, which is quite limited. Park near the intersection of Wood Duck and Goldeneye and find the trail to the river corridor. There is good riparian habitat both upstream and downstream of the access point. Wearing amphibious shoes will enable you to cross river channels. Located just north of the town of Capay on Rd 85 on the north side of Cache Creek, this park offers a ramp access down to the river corridor. On summer evenings, this is a wonderful place to watch Lesser Nighthawks. Denoted Rd 40 on most maps, this road emanates from the lower picnic area of Cache Creek Co. Park on Hwy 16 west of Rumsey. This road provides access to chaparral habitat on Blue Ridge, where Bell's Sparrow, Common Poorwill, and Mountain Quail reside. Unfortunately, the road is now closed to vehicles right at the start, at the low water bridge over Cache Creek. It is open to foot/bike only beyond that point. 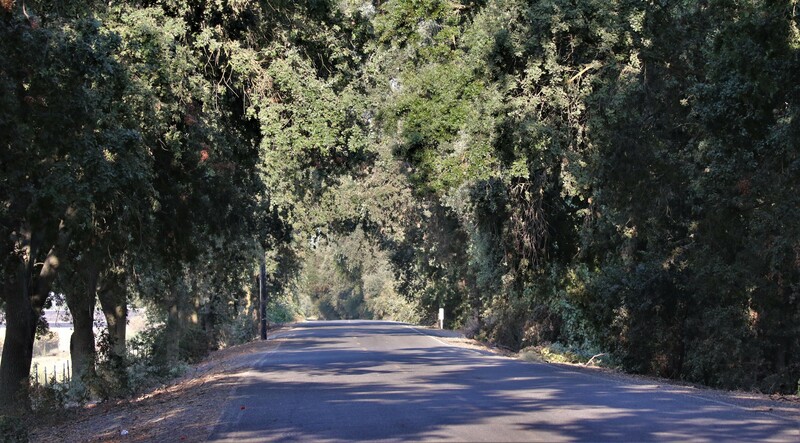 The road climbs through oak woodland for about 3.5 miles before reaching chaparral. After that, it's another 1.5 miles to the crossroads at the summit. From there, if you go straight, the road descends to Davis Creek Res. ; to the left (south) it is a half mile to Fiske Creek Lake (a pond). Spring migration! It's not as filled with vagrant potential as fall, but the birds are in their best dress and thus easy to identify. This time of year I'm on the valley floor for shorebirds (Yolo Bypass Wildlife Area is often best now, but other spots can be good-- it just depends on water levels). I'm also checking any riparian or wooded habitat for warblers, flycatchers, and other migrants. While most birders would put Rayhouse Road on the top of their list for passerine migrants, I've had just as good (or better) mornings with warblers in valley oaks on the valley floor (e.g., along Willowbank Ditch in S. Davis). If you know how to identify these trees, you'll find the birds. This May, I'll also be canvassing marshes at dawn in search of Least Bitterns and possibly heading to Berryessa Dam for a Black Swift (if I'm lucky). Migrant songbirds are especially worth looking for after a rainy/stormy night. 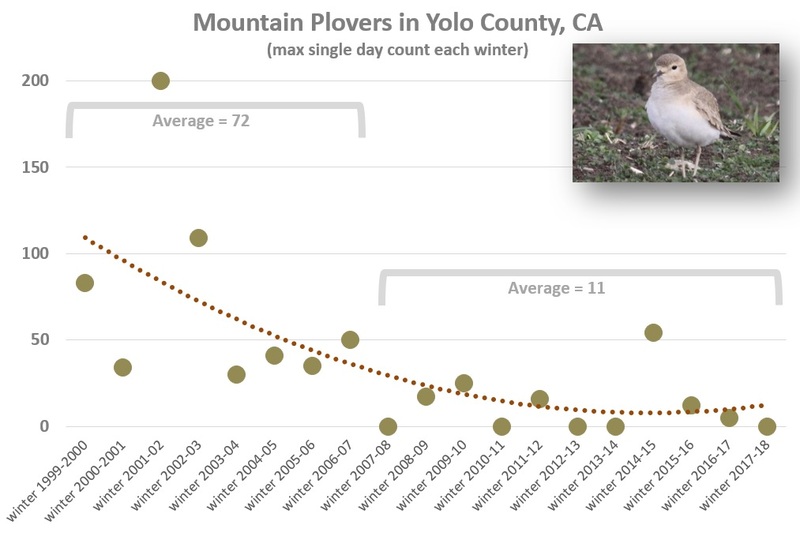 This is often thought to be a dead time in Yolo County; the doldrums between spring and fall migration when all that's here is whatever breeding birds we have. My primary activity during this period is to look for Yellow-billed Cuckoos migrating north along the Sacramento River. There are less than 100 left up the Valley, but they must pass by us each year. 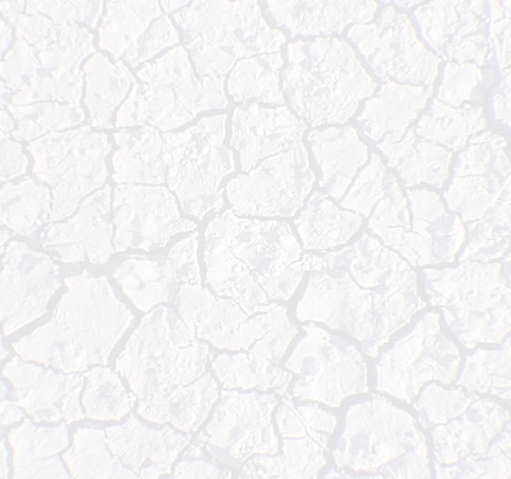 I've found one so far-- at the Cache Creek Settling Basin. This is also a good time to head up Rayhouse Rd to explore the specialties that nest up there. I enjoy checking water bodies and riparian areas on the valley floor in June, hoping for a surprise, or at least enjoying the Blue Grosbeaks. 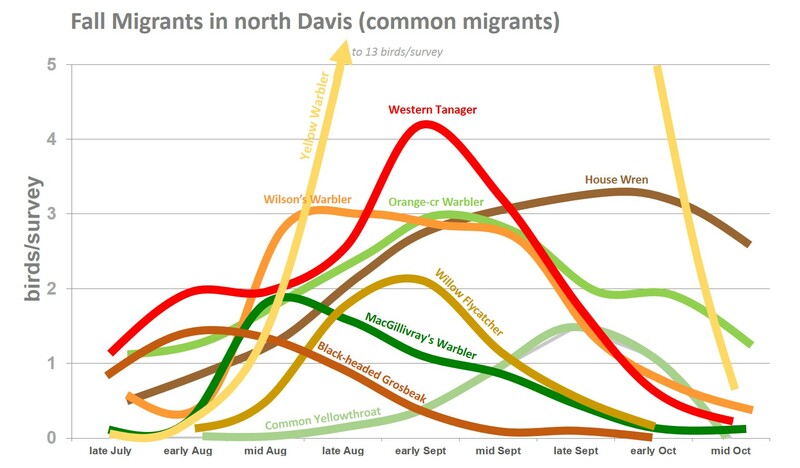 Fall shorebird migration is in full swing in mid to late summer, and that's pretty much all I focus on here. The key is to find the location with the best water levels and the most birds and to check it as often as possible. 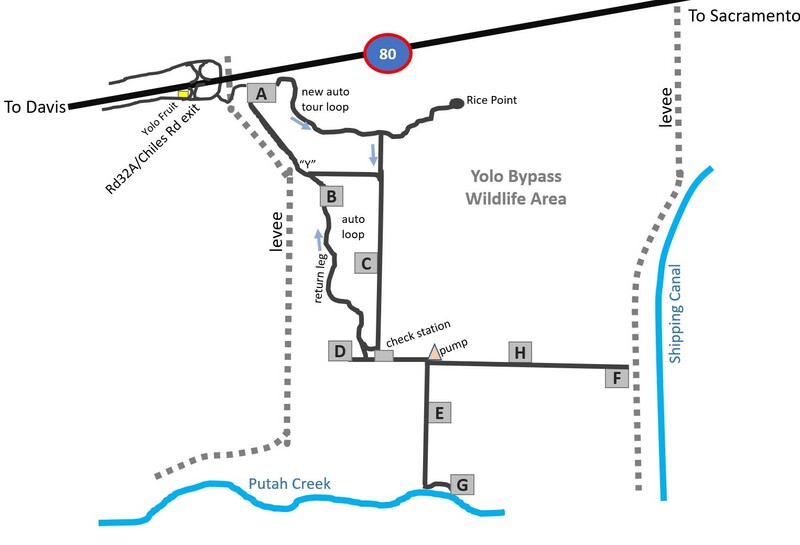 The Davis Wetlands is often managed for shorebird habitat, and the Yolo Bypass Wildlife Area has dedicated "shorebird ponds" for July and August. 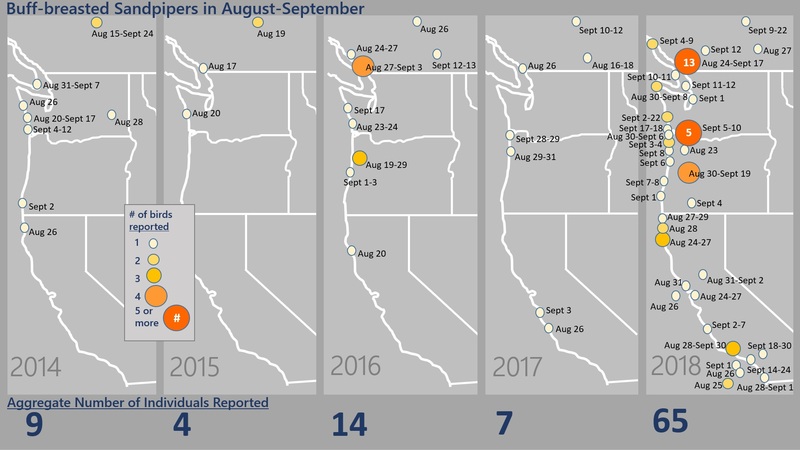 Songbird migration begins to pick up in late August; see below. I suppose most birders would say these are the best birding months of the year, and who could argue? 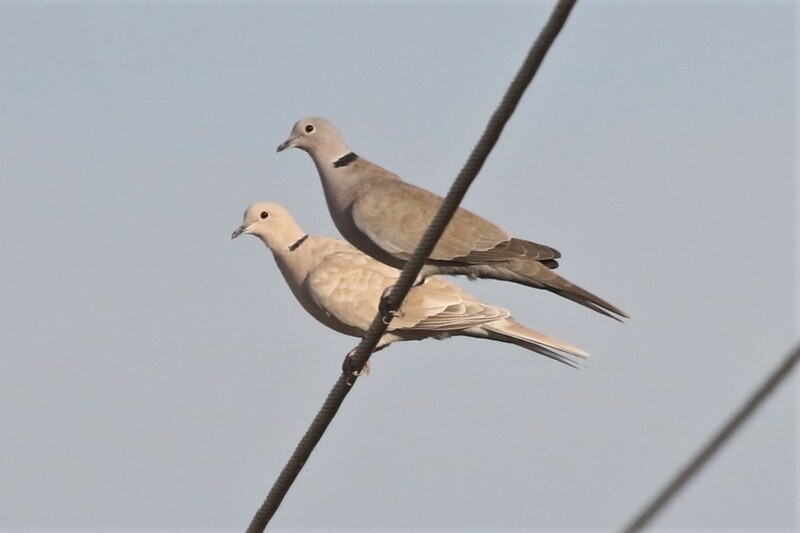 Lots of birds, with immatures all around, most species in migration, birds dispersing everywhere, and rare vagrants expected any time, any place. If you're not running off to Pt Reyes, you can continue focusing on shorebirds (see above), but also focus on songbirds. Just about any location is worth checking in the fall, but good riparian areas on the valley floor are typically excellent, and even a nice weedy field like the Solano Park gardens offers a fine morning of birding. 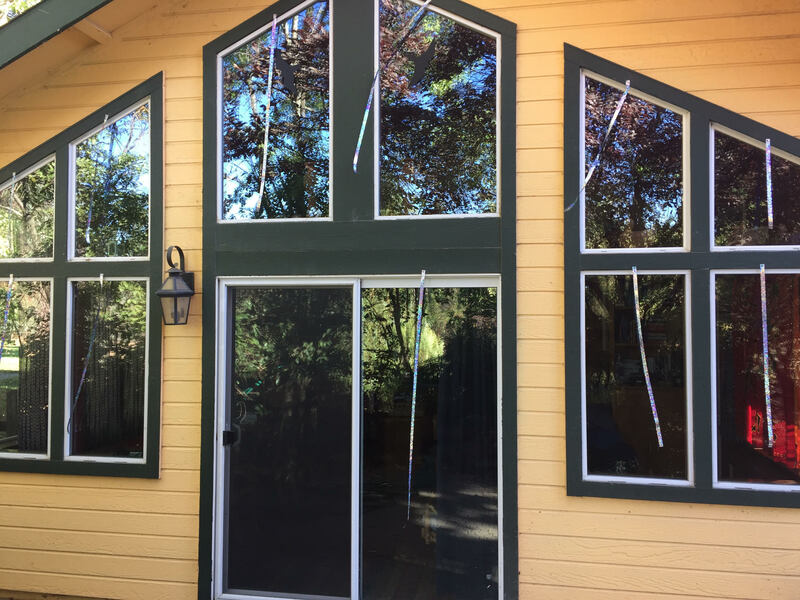 The most popular spots are Babel Slough and Putah Creek Riparian Reserve, but there's plenty of promise around Winters, Knight's Landing, Cache Creek Wild Wings Park, and even suburban Davis and Woodland. A life list is simply the total number of species recorded in one's lifetime, in this case, within the boundaries of Yolo County. These numbers below include all ABA species, including these six introduced species: Wild Turkey, Ring-necked Pheasant, Rock Pigeon, Eurasian Collared-Dove, Eurasian Starling, and House Sparrow. These ABA-countable exotics are not established and thus not considered countable in Yolo County: Mute Swan, Egyptian Goose, Rosy-faced Lovebird, Scaly-breasted Munia. Because these numbers are constantly changing, this list will be allowed to constantly change. Please feel free to submit to me your Yolo life list total as often as you see fit. The Central Valley Bird Club maintains a webpage with past journal articles. While most of the articles are relevant to Yolo County birds, below are direct links to articles with a specific focus on Yolo County.